We adored working with the loveliest bride Winnie to create a bespoke wedding headpiece for her upcoming wedding. Winnie’s favourite styles from the collection were the EDEN and the HELENA headpieces – much loved styles for their organic styling, delicate details and floral elements. In creating her custom headpiece, we looked to these two styles for inspiration and customised the colour scheme and layout to suit her bridal look. 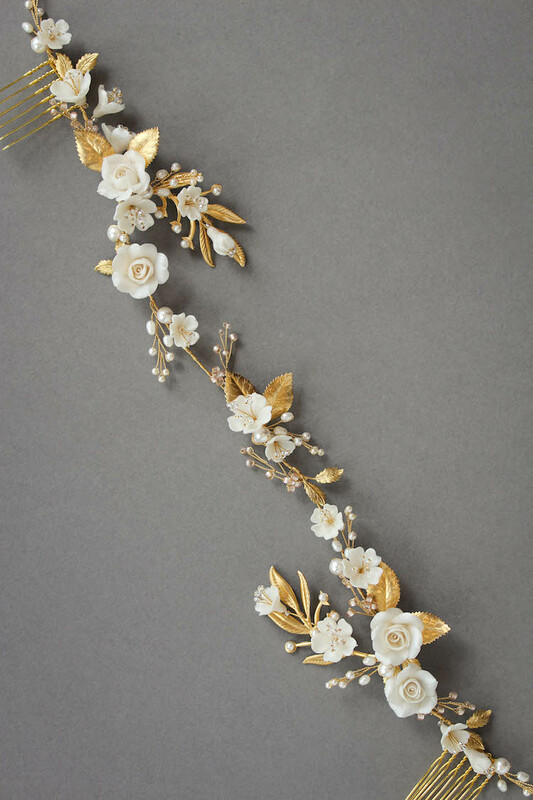 This special headpiece was designed to wind along Winnie’s hairline, featuring pearl and crystal details at perfect intervals to frame her loose curls and sweeping part to the right. Although it’s designed to be worn along the hairline, it can also be flipped over and worn backwards to captivate her guests from behind. It’s always lovely to offer our brides a second way of styling the one headpiece and there’s no doubt Winnie’s headpiece will exude whimsical and elegant appeal no matter how she chooses to wear it. Rather than a formal crown or tiara, this piece is designed to be positioned directly on the hair to sit more as a wreath. The mid-section feels airy and spacious and the side clusters are slightly more detailed to perfectly frame her face. There are so many things we love about Winnie’s bespoke headpiece. There’s no denying we love its carefree spirit – as if it’s been plucked from among the vines. Its organic styling adds a touch of bohemian sophistication and the inviting tones of soft ivory, gold and touches of blush pink feel effortlessly chic. To add a final touch of glamour to her ethereal organza and lace wedding gown, Winnie will be pairing this headpiece with our LOUVRE veil in soft ivory tones. This cathedral veil will frame the dramatic long train on her dress and create a look that’s regal and romantic. If you’d love to chat about how we can customise our designs to suit your wedding dress and hairstyle, send us an email and share photographs. We’d love to work with you to help you bring together your bridal look.